It’s very rare that I mange to read a full 500 page book in one day, no matter how hooked I am. I have a six-year old daughter who demands much of my time and rarely lets me read as she gets on with something quietly. So the fact I read Divergent in its entirety the day it arrived speaks volumes. Ok, I’ll admit it, I enlisted the help of the unpaid babysitter who sits in the corner (TV), ordered takeaway so I didn’t have to cook, abandoned any kind of housework and bribed my daughter continuously to let me read just a few more pages. Even she became obsessed with my reading progress that day asking ‘How many pages have you read now Mummy’ and appointed herself my official reading cheerleader. That’s how good this book is. Once started you won’t be able to stop until you have devoured every breath taking word. As one of my top 3 anticipated books for 2011, I couldn’t wait to get my hands on this book. Of course being so excited can often lead to over anticipation with the book becoming a let down. Absolutely NOT in this case, Divergent was everything and much, much more than I was hoping for and has easily shot straight to my top read of the year, the last two years in fact. It’s going to take some beating. For once I’m going to refrain from hashing over the plot, I couldn’t do it’s intricacies justice and really don’t want to inadvertently give anything away that will spoil the book, so readers can go into it the same way I did. What I will say though is that Veronica Roth’s dystopian world is exquisitely built with complexities and detailing that will force the reader right into the very heart of it from the moment they pick up the book. It’s clever, exciting, brutal, jaw droppingly shocking and intense. I adored lead character, Tris, the underdog who comes into her own. She’s brave, loyal and intelligent, fierce and compassionate in equal measures. Then there’s Four (Tris’s coach in the new life she chooses) the HOTTEST, most swoonworthy guy ever. I’m slightly obsessed by him, I’ve even dreamt about him and I completely fell in love with him. The romance between Tris and Four is solid, real and beautiful. It developes at the right pace, it has the right amount of intensity and passion, yet it doesn’t overwhelm the story at all. Divergent is an action packed and exciting read set in a brutal and violent world after all and the balance between action and romance is perfect. To sum up, I LOVED this book big time. I found it hugely addictive and couldn’t part from it for a second I was that engrossed and involved in it. I think I read it with my eyes on stalks, my mouth hanging open and with my heart pounding throughout, It’s the most exciting book I’ve read for a long time. The final pages set up fantastically for the sequel and the wait for it is going to be sheer torture. 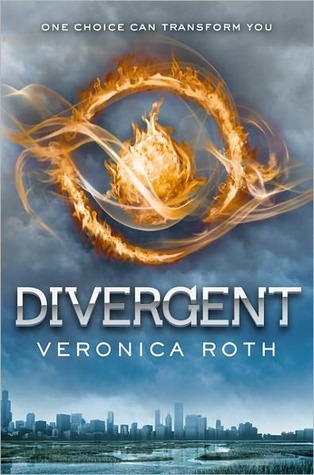 Seriously, if there is one book you must buy this year it’s Divergent, I whole-heartedly recommend it and then some. Just make sure you have a spare few hours because I’m warning you, once you start you won’t be able to stop. Many Thanks to the publishers for providing me with a copy for review. Wow – I so need to read this next. This is one of those books I want to read so bad because there's so much hype about it! (Although I would have read it amyway because I love YA dystopia). I wanted a review copy but had no luck. I totally agree with your review – this book was AMAZING. I loved it!! Can't wait for the book to be released so everyone else can get a copy of it too! Great review! I've heard great things about this one,and I'm excited to read it too. Everybody seems to have gotten this one for review, but not me! Out of the loop!! lol! I am so very jealous but also happy that you loved this book. Like you this is one of my most anticipated book this year. Your brilliant review just has me more excited than ever. I love your review! You totally nailed it, this book was just mind-blowing AWESOME! I'm planning on re-reading before release so every little detail is fresh in my mind again so I can gush with the rest of the world. I can't believe we have to wait so long for the sequel, torment, torment! I loved this review – and wow at reading 500 pages in one day.